(Newser) – President Trump managed to do an about-face on no less than three policies in an interview with the Wall Street Journal on Wednesday—and he made what analysts say were highly unusual comments about the American dollar in the process. "I think our dollar is getting too strong, and partially that's my fault because people have confidence in me," Trump said, adding that while a strong dollar sounds good, it will "hurt ultimately." But despite his concerns about a strong dollar making it harder for American firms to compete, he did an about-face on his campaign promise to label China a currency manipulator, saying Beijing hasn't manipulated its currency for months, and he doesn't want to risk losing China's cooperation on North Korea. I'm not saying that McDonald should be killed, but can we kick him off the f***ing planet? Just spent 950 of them things to have a tree cut down, last year 1,200. Trees and Strong Dollars are breaking me! 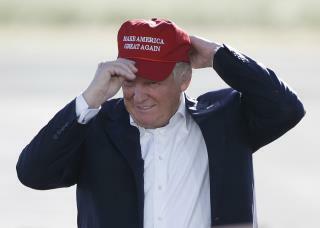 I wonder where the "Make America Great" hat he's wearing in the picture was made. China maybe.